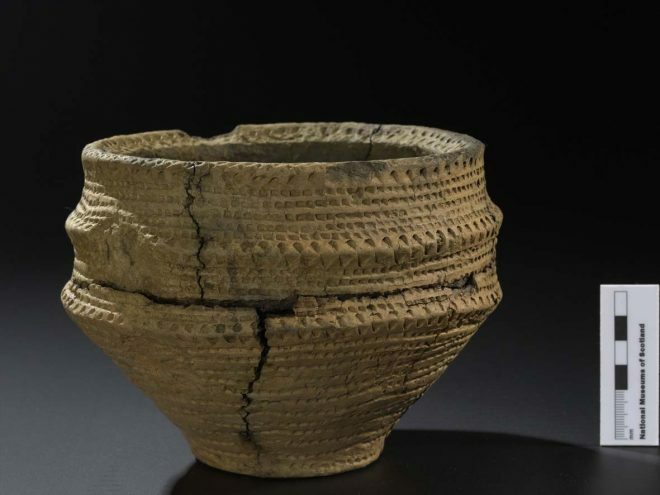 The Scottish History and Archaeology Department at National Museums Scotland has provided post-excavation service since 2004, with a full-time post-excavation officer in place since 2012, but this is our first foray into the world of blogging. It seemed sensible to start at the beginning with an introduction to what our post-excavation work involves. 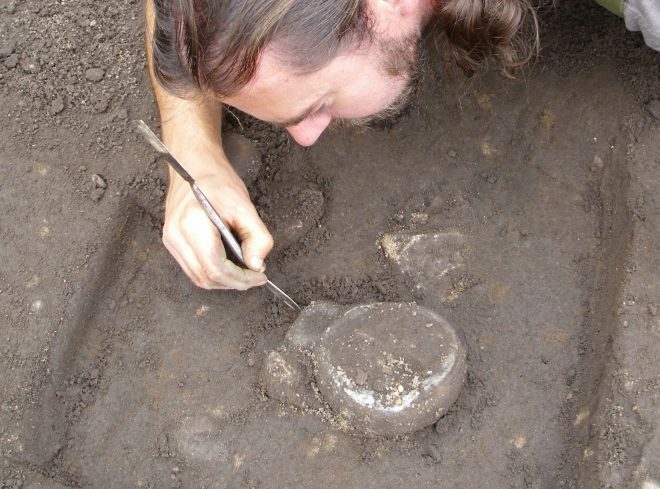 ‘Post-excavation’ is a term used to cover a wide range of work undertaken after an archaeological excavation, including processing soil samples, illustrating artefacts and trench plans, writing specialist reports and a range of other tasks which ultimately lead towards publication of the excavation. At the Museum we specialise in the artefact-focussed parts of post-excavation work, though are often involved other elements too. Post-excavation artefact analysis includes everything from washing and packing to detailed specialist analysis. Iron Age stone lamp under excavation at Clarkly Hill, Moray. We offer this service to a wide range of people, including commercial archaeological companies who undertake excavation in advance of developments such as roads or housing, community projects, and research ventures undertaken by a wide range of organisations and individuals. This can involve managing the whole post-excavation process for an assemblage of several thousands of artefacts, or working on a single artefact. It includes all different materials and times, from the earliest inhabitants of Scotland in the 13th millennium BC onwards. 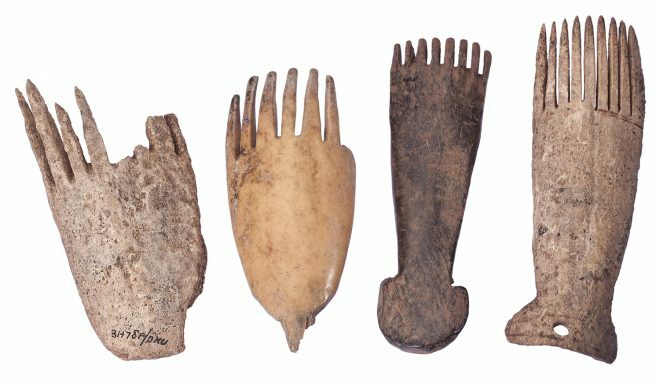 Iron Age long-handled bone and antler combs from Broxmouth Hillfort, East Lothian. The post-excavation service is managed by Dr Gemma Cruickshanks, who organises the logistics of each project as well as working on many of the artefacts herself. Many other staff members contribute their expertise too, including many curators, the Conservation and Analytical Research team and the Photography department. While we try to undertake as much of this work in-house as possible, some specific expertise is not available here, and we work with our wide network of external contacts across the UK. 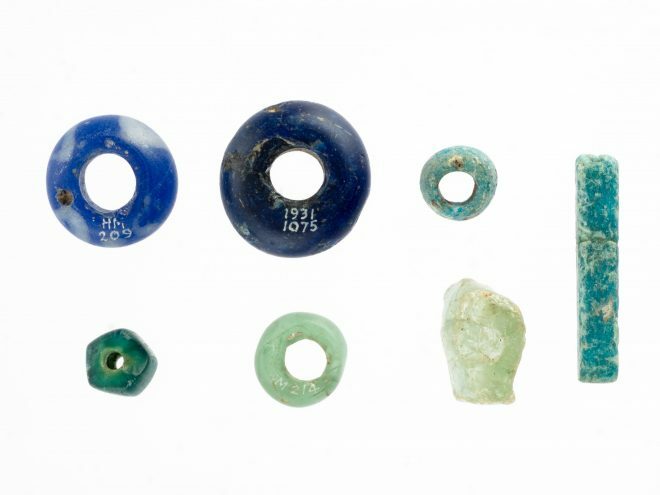 Late Bronze Age, Iron Age and Roman glass beads from Sculptor’s Cave, Covesea, Moray. Much of this work is undertaken in our new and shiny post-excavation workroom at the National Museums Collections Centre in Granton. Our new workspace provides essential well-lit space for laying out artefacts – one of the simplest but most important tools for analysing an assemblage. For example, we can now lay out whole pottery assemblages to look for re-fitting fragments, rather than working with small portions at a time. This gives us a much more realistic idea of how many different pots were present on an archaeological site. Early Bronze Age food vessel from Dunure Road, Ayr. As well as giving exciting results for the excavators, the post-excavation service brings many benefits to the Museum, including the opportunity for our curators to study the latest discoveries before most go to new homes in other museums. This brings benefits to us, but also allows the new finds to be put into their wider national context. This is just a taster! Future blog posts will look in more detail on particular artefacts or assemblages we are currently working on. You can find out more about the post-excavation service at www.nms.ac.uk/postexcavation.